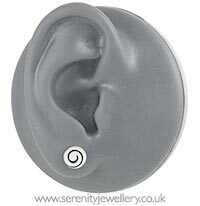 Hypoallergenic surgical steel 7.5mm swirl stud earrings with surgical steel butterfly backs. These earrings look good - I got several compliments about wearing them and are comfortable to wear. 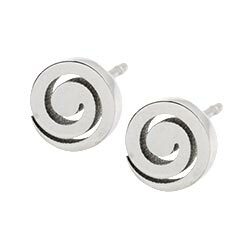 The posts are quite thick, so if I haven't been wearing earrings for some time, I would normally insert an earring with a thinner post first, and then swap to these earrings. The lock feels very secure. I really like these earrings they are very pretty and just the right size for my ears. They are a little thicker than I expected but you don't notice one they are on. No reactions as well! Earrings are lovely just what I wanted and they were delivered very quickly.